A safe working environment has to be created anew each day through collaborative effort. The foundation for these efforts is indispensable in this connection. And the preparation for this is done long before picking up a single tool. The number of fatal accidents in the construction sector has greatly increased in recent times. Since we are aware of the dangers on construction sites, safety is an extremely high priority in Heras. 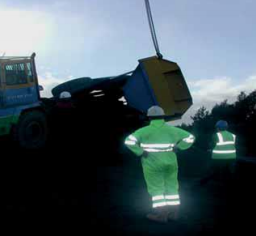 Among other things, Heras focuses on improving safe working and living environments on construction sites. We achieve this not only through our products, but also through our working methods on our own locations and the locations of the customer. 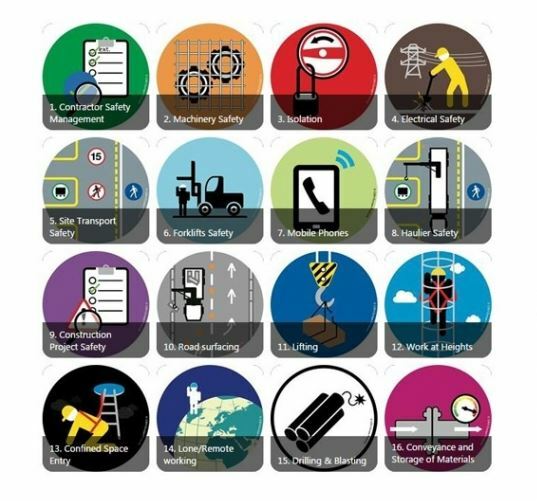 Heras has its own HSE policy (HSE: Health, Safety and Environment) and the 16 Life Saving Rules. When our employee enters a construction site, he/she is not merely responsible for his/her own safety but also that of visitors or persons accompanying him/her, if any. These rules have been drawn up to optimally protect our own employees and partners. A brief explanation of each Lifesaving Rule shall be found below. There are many fatal accidents amongst contractors. A pre-qualification system for (sub)contractors is extremely important. This ensures that subcontractors as well as our own employees can work safely. In the pre-qualification system, answers are requested to important questions such as: ‘who is present at my location?’, ‘What are the materials that this person has with him?’, ‘Have these materials been inspected?’, ‘Is the (sub)contractor insured?’ ‘What work will he be carrying out?’ Replying to these questions ensures that the persons who enter the premises shall carry out work safely. Machines interact with humans. It is therefore extremely important that sufficient attention is focused on machines. ‘How do you use the machine?’, and ‘Which moving parts must be guarded/screened off?’ These are important questions. These Lifesaving Rules are supplemented with Machinery Safety Guidelines developed based on practical examples. A machine should not suddenly start operating and cause crushing injuries or falling accidents. It should not be switched on when work is being performed on the machine. All power supply should be switched off and secured against restarting. For this reason, various focal points to ensure this safety aspect were developed. Each year, there are thousands of industrial accidents involving machines. The vast majority of these accidents are caused by the unexpected switching on of the power supply. 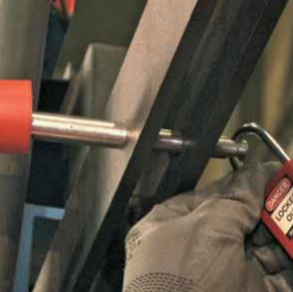 Lockout Tagout is a safety procedure in which machines and other power supply sources are switched off during maintenance and repair works. If there is a unique/ individual lock, you cannot switch on the machine. Over the years, there have been a large number of fatal accidents caused by electricity. It is therefore important that persons who work on electrical installations are trained for the same. If you use portable electrical appliances, check the same for damage, and whether the power cord and plug (socket outlet) are in an undamaged condition. 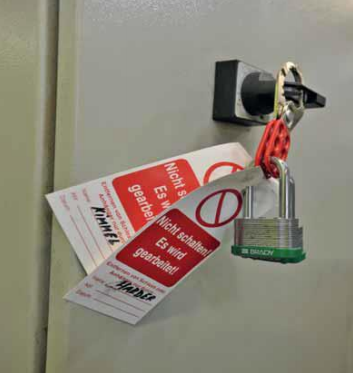 Ensure that all electrical rooms and cabinets (panels) are properly locked and can only be opened with a special key. Never try to “tinker” with electrical equipment on your own, but call an expert employee (electrician). open traffic safety analysis. ‘How are the traffic flows organised in your location?’ and ‘What are the locations in which there is pedestrian traffic?’ These are important questions. The aim is to keep pedestrians away from moving vehicles on the location, particularly fork-lift trucks, as far as possible. A revolving light, a reversing horn, a speed limit (16 km/h forwards and 5 km/h backwards), and a seat belt. These are just a few extremely important considerations whenever fork-lift trucks are used. It is also important that the fork-lift truck driver has undergone the appropriate training courses and that these are regularly repeated to enable the proper use of fork-lift trucks. As a pedestrian, you should keep in mind that the fork-lift truck driver has limited visibility. Heras has drawn up a policy designed to prevent accidents caused due to the use of mobile communication media such as mobile telephones. 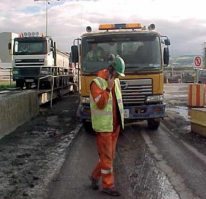 Among other things, the use of mobile phones in the workplace shall be restricted to an absolute minimum; all Heras vehicles are also equipped with a hands-free set or a Bluetooth system. The rules specify the conditions under which the use of a telephone is safe. The necessary personal protective equipment should also be available - and used. Construction projects are often large-scale activities. In addition, there is often a large number of extremely diverse works being conducted on site by contractors/external parties. All of this together means that there may be a considerable risk of minor to major injuries during such projects. This Lifesaving Rule is supported by several manuals and guidelines that must be complied with when working on a construction site. The construction/maintenance/repair of roads is a major activity for a number of our companies. For Heras, regular work is carried out on or near public roads. It is important that appropriate measures are taken to safely execute work on or in the vicinity of public roads. This relates for example, not only to traffic measures, fencing, etc. but also the presence of overhead and underground lines. 'What are the requirements that apply to lifting operations?' Material must be inspected, must be capable of handling the lifting load (number of kilograms), and they should not be overloaded, for example. All of these aspects are included in a lifting plan, in which safety measures are also laid down. For example: do not walk under loads, mark off the lifting area, take due account of different weather conditions, etc. Working at a height must be as safe as working on the ground. And persons who work on the ground must be protected against falling objects. The use of a hydraulic platform or the construction of a good scaffolding is extremely important in this connection. Harnesses that protect the employee in case of a fall can save lives. Working near water, for example in ports, also requires specific measures, and the same are ensured here. Sometimes, work has to be done in confined spaces. Or spaces that are not normally accessed by people. For example, confined areas such as deep trenches or deep pits. For example, you must ensure that the sides do not collapse. This requires a specific approach in which risks must be assessed and measures must be taken. In addition, during the work, you must be alert to fire hazards, gases and vapours that may arise due to welding for example. Circumstances may also occur in which there may be oxygen deficiency. Working alone should be avoided to the extent possible; it is extremely risky. If working alone is unavoidable, it is important to take adequate measures. In the open mining sector, explosives are frequently used to gain access to raw materials. A practical guide has been drawn up to ensure safety in places where explosives are used. Cement appears to be a simple product, but there are several aspects to it. Thus, during the production of the same, a lot of heat is generated. But also think of hydraulic installations where the temperature can rise significantly. Preventive measures have been established for contact with hot material, gases and surfaces and for the prevention of fire and explosions. Preventive measures are also in place to prevent over-pressure in boilers. All persons who work with Heras are working with a party for whom safety is a matter of high priority. A safe environment has to be created anew each day through collaborative effort. 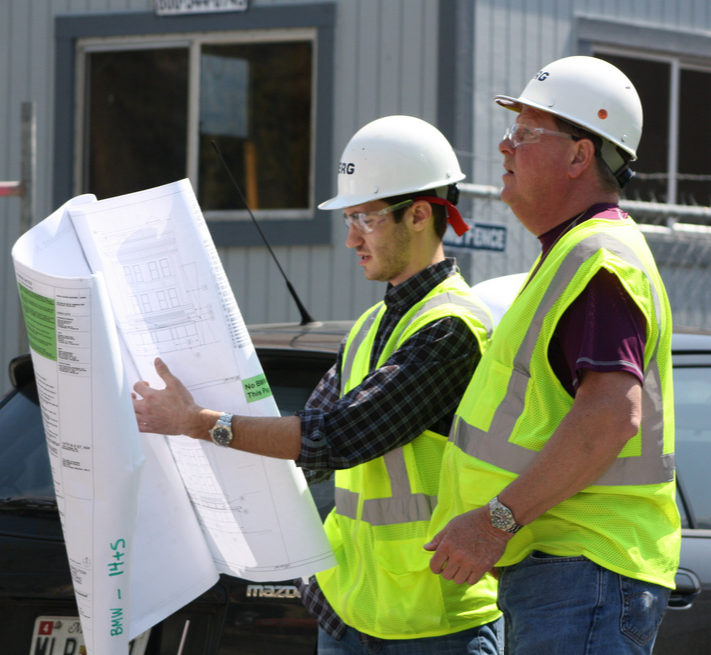 Daily operations determine and ensure the level of safety at the construction site. We are always happy to talk with you about it. Safety is key!